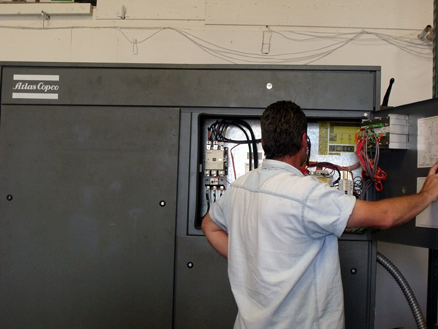 Emergency Service - Corey Compressor, Inc.
Our extensive crew of trained master technicians are automatically dispatched 24/7, each equipped with a service vehicle, tools, and parts to get your equipment back up and running, so you can get back into production as quickly as possible. Sullair, Atlas Copco, Ingersoll-Rand, Chicago Pneumatic, Kaeser, Champion, Gardner Denver...and many more! In the event your part is not in stock, our vast repository of vendors enables us acquire your part as quickly as possible, or if your part is no longer available we can retrofit a comparable part to replace the original and keep your system up and running! We have continued the tradition started over 100 years ago of offering 24/7 Emergency Service. 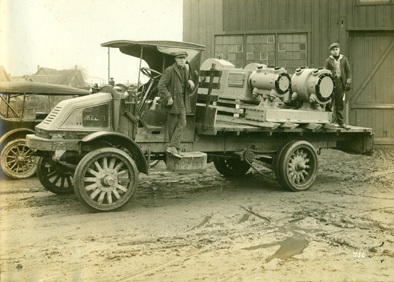 Seen here is the rush delivery of Bury water cooled, double acting, two stage, belt drive, compressor on a Kelly-Springfield chain drive truck, built in 1918. 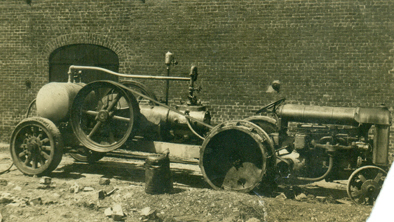 This portable Bury compressor knew how to get the job done. This water cooled, double acting, single stage compressor, built in 1912, would produce 160 cfm @ 100 psi.